1116, Hubcap used, 14", 85-87, BUICK, REGAL, POLISHED METAL, 40 SLOT TYPE. MACHINED CENTER, BLUE & CHROME LOGO, METAL CLIPS. 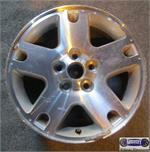 1116, Hubcap used, 14", 85-87, BUICK, REGAL, POLISHED METAL, 40 SLOT TYPE. MACHINED CENTER WITH BLUE & CHROME LOGO, METAL CLIPS. 2014, CENTER CAP USED, 92-95, DODGE, PLYMOUTH, CARAVAN, VOYAGER, BRIGHT MACHINED FINISH, 5 LUG NUT HOLES, 3 SCREW ON POSTS, 6-5/8" DIA. 2369, Used Rims, 19X7-1/2, 5 LUG 5", 07-08, CHRY, PACIFICA, 51 MM OFFSET, BRIGHT MACHINED, SILVER POCKETS, SILVER GROOVE IN SPOKE, 5 SPOKE, ALUM. 2369, Used Rims, 19X7-1/2, 5 LUG 5", 07-08, CHRY, PACIFICA, 51 MM OFFSET, BRIGHT MACHINED, SILVER POCKETS & SILVER GROVE IN SPOKE, 5 SPOKE ALUM. 3214, Used Rims, 15X6, 4 LUG, 4-1/4, 95-00, MERCURY, MYSTIQUE, 7 OVALS, MACHINED FINISH, DARK SILVER POCKETS, ALLOY. 3378e, CENTER CAP USED, 00-02, MERCURY, COUGAR, BRIGHT MACHINED, 6 SPOKE WITH COUGAR HEAD, 6 PLASTIC CLIPS, WIRE RING, 6-1/2" DIA. 3497b, CENTER CAP USED, 03-05, FORD, CROWN VICTORIA, BRIGHT MACHINED FINISH, RAISED OUTER LIP, BLUE FORD OVAL, 5 PLASTIC CLIPS, WIRE RING, 6-1/2" DIA. 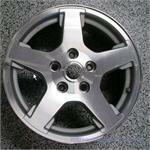 3565a, Used Rims, 16X6-1/2, 5 LUG, 4-1/4", 99-03, FORD, WINDSTAR. BRIGHT MACHINED FINISH, 5 SINGLE SPOKE, ARGENT/CHARCOAL POCKETS. B= PAINTED SILVER ON ENTIRE FACE. 3628a, Used Rims, 17X7, 5 LUG, 4-1/2", 06-09, FORD, FUSION, BRIGHT MACHINED FINISH, SILVER POCKETS, 5 SPLITS SPOKES, A=SILVER B= PAINTED ARGENT. 3632, Used Rims, 17X7, 5 LUG, 4-1/2, 06-09, MERCURY, MILAN, 14 SPOKES, BRIGHT MACHINED, ALLOY. 3632, Used Rims, 17X7, 5 LUG, 4-1/2, 06-09, MERCURY, MILAN, 14 SPOKES, BRIGHT MACHINED, ALLOY. NOTE:VEHICLES WITH TPMS SHOULD BE REPLACED WITH LIKE WHEELS. 4514, CENTER CAP USED, 93-94, CADILLAC, FLEETWOOD, BRIGHT MACHINED OUTER RING, SILVER BACKGROUND, CHROME CREST AND LEAF, PLASTIC CLIPS, 7-5/16" DIA. 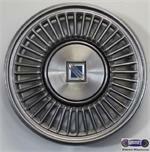 4514, CENTER CAP USED, 93-94, CADILLAC, FLEETWOOD, BRIGHT MACHINED OUTER RING, SILVER BACKGROUND, CHROME CREST AND LEAF, PLASTIC CLIPS, 7-5/16" DIA. FOR A 15", RIM. 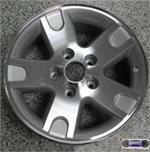 62422, Used Rims,17X7, 5 LUG, 4-1/2" 04-06 NISSAN, MAXIMA, 7 SPOKE ALUM. MACHINED FINISH FACE ON SPOKE AND OUTER EDGE, PAINTED SILVER POCKETS, ALLOY. 69516, CENTER CAP USED, 07-11, TOYOTA, TUNDRA, BRIGHT MACHINED FINISH, RAISED CHROME LOGO, 5 LUG NUT CUTOUTS. 5 PLASTIC CLIPS, STAR WIRE, 6" DIA.